For his directorial debut, Lost River, dreamboat actor Ryan Gosling rounded up a host of talent and headed to the deserted streets of Detroit to tell a dark urban fairytale about love and loss. Mad Men star Christina Hendricks takes the lead playing a world-weary mother struggling to keep her small family together in a real-life world gone wrong, which, at times, delivers a Lynchian level of surrealism. The Skinny: You’ve made some really interesting film choices recently. What do you look for in a role? Iain De Caestecker: I don’t specifically look for a key set of things but sometimes something hits you that you can’t really explain and gives you a certain feeling of excitement. There’s a side to it where it’s about the people who are attached, whether it’s Ryan with Lost River, who’s someone you might be a fan of already, and also whether something feels like it’s original, an interesting concept or a story worth telling. It’s all of those factors mixed together but I’m not too premeditated about what my decisions will be. I’m also very lucky just to have very interesting projects put in front of me. There’s a great amount of luck involved with it as well. In Fear, your film before Lost River, had a very unusual shooting style – director Jeremy Lovering didn’t let you know what was going to happen to your character during filming. Was Ryan Gosling’s directing style similarly innovative? It’s funny you should say that actually, because it was quite similar to Jeremy Lovering and the way he shot In Fear. It was an incredible way to shoot, especially as an actor. It taught me a lot, and Ryan was similar. Ryan was very collaborative, and he didn’t have to be – he wrote this great script and everyone trusted him before we came on to the project but he wanted to be very collaborative, that was part of his process. He wanted everyone to bring their own ideas and thoughts and input. You don’t always get that, but it meant that there was a lot of freedom on set and there was a great connectivity between everyone and a real buzz and excitement. It was a very cool experience to come into something like that and feel like you’re a big part of the whole process. Ryan has said that he wanted to make sure everyone was comfortable on set. Was this the case despite the movie’s dark tone? Yeah. I do think it’s a dark story but actually there’s a whole urban fairytale side to it and moments of humour in there. Ryan would also talk about how he didn’t want it to be too down. There are moments of real heart and the theme of cheering on the side of love that runs throughout. There were dark times and places that you’d have to go to that were difficult but it was also a very happy place to be around. There was definitely an atmosphere and buzz on set that was exciting and everyone just seemed to get on very well. Sometimes when you’re filming something like this and it’s quite enclosed there’s a very family atmosphere and everyone takes care of everyone else and we all spend all our time together. I only have fond memories of that time. How did you guys spend your time off set to relax? Who was the biggest lightweight on set? Saoirse Ronan probably, a few beers and she’s down! Naa, I’m joking, we didn’t just get drunk all the time. But we had fun when we could. Detroit’s an amazing place. It’s got this amazing underground music scene and obviously it’s got a lot of musical heritage, and going out into the city and all these hidden places at night was great. There’s so much to do in Detroit, there’s always something going on so we would explore the city together and luckily we all got on so well, so spending time with each other was something that we all really looked forward to. 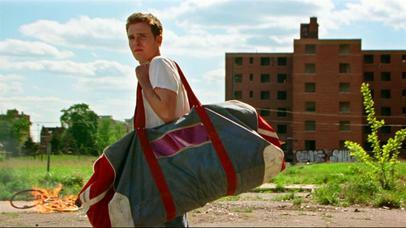 Detroit is like an unofficial character in the film. Was it shot in a real deserted town? Well there are suburbs of Detroit with streets with only one family living there and there are whole neighbourhoods without electricity or with nobody there. The city’s had a lot of very difficult times in recent years so a lot of the sets that we filmed in were real and they had this amazing atmosphere about them. They’re like the best set ever built because when you go in them you can feel an energy from what was there before and at the same time the people there are just amazing and they became very big characters in the film. A lot of them wear their heart on their sleeves and would come in and we’d ask them to tell us about their lives on camera and they would. They’d spill everything to us and they were very important figures in the film as well. Yeah we did improvise a lot. Maybe they’d be walking by and Ryan would say, “Do you want to be in the movie?” And you’d just let them speak because they’re far more interesting than me or my character can ever be. So you’d just give them free reign and try to push them in directions that would be interesting to the film. They taught me a lot about acting and what it means to just be yourself in front of the camera. They were a great addition to the film. How did you view your character, Bones, when you first approached the story and how did he develop? It was quite an organic process. I went to Detroit about three or four weeks before we started filming and spent a lot of time with Ryan and really spent a lot of time discovering the city and figuring out what it was like to be from the area that he was from. That gave me a lot of inspiration. I spent a lot of time by myself, like the character would, and realised through that process that he was a very internal character and that became a big part of him. I lost weight as well and everything just meshed together to become what he became. Ryan gave me a lot of ideas that I used. I would go around the city and meet people in character and that became a big part of the process for me. It was a really great way to find him. The film looked quite exhausting – you always seem to be running, swimming or on your feet. Were you knackered by the end of the shoot? Oh yeah, for sure. I tried to put everything that I could into it, so by the end you don’t have much energy left. But there was never a moment that I didn’t want to get up in the morning to go to set. To have that experience was still incredible every day, right up until the end and I definitely didn’t want it to stop. Lost River is one of those films where people form their own theories about it. Have you heard any strange explanations from fans on Twitter who claim to have it figured out yet? Yeah, that’s been really interesting actually. I was excited for it to come out just to see what people thought and people do send you different takes on what they think it’s about. That’s the beauty of cinema, and art as well: that it can affect people in different ways and they can take different meanings. I don’t think there is one exact particular meaning to it; it’s whatever you want to take from it. It’s actually been really interesting listening to what other people thought of the movie. Did it? The line in the script was originally just “Science”, and for a joke we did a few takes where I was like, “Science Beyotch!” and I was very surprised they kept it in. Clark [Gregg], who plays Coulson, sent me a text saying they kept it, so I was happy they did. I didn’t know people talked about it on Twitter though. That’s cool! It’s going to become your new catchphrase. Yeah, I’ll just say it all the time now. You’ve been playing Leo Fitz in that show for a while now – what have you learned from playing him? You learn a lot, actually, because there are periods where you’re playing the same character for so long and you think, “It’s been two seasons that I’ve played him for now and I don’t know what else I could do with this character,” but the writers are very smart at taking it in new directions, especially for Season Two. They definitely took Fitz in a whole new direction. He grew up a lot, as did every character. That actually becomes exciting to think about, rather than find a new character. It’s like, what else can we show or how else can this character change? That becomes a very exciting experience. I have no idea what they’re going to do for Season Three, but I’m intrigued to find out what they’ve got in mind. And finally, you’re originally from Scotland but have lived in LA for quite a while. How difficult is it to find Irn-Bru over there? Such a good question… I actually got a guy to sell it in a shop near me. I asked him to buy it in and he did for a while and then stopped one day because no one else was buying it but me. There are places you can find it and my auntie sent over a big crate of Irn-Bru for me. But actually, for my health, it’s probably good that I don’t get to drink it as much as I can. It’s such a good drink, though. That’s the first thing I do when I get off a plane back to Scotland, I buy Twiglets and a bottle of Irn-Bru.